I have a very good excuse for making another bread in a row, Champa of Versatile Vegetarian Kitchen is hosting a CSN giveaway for which she has a condition that bake/cook anything from her blog , so what can be a better reason for trying new recipes & also I really like her baking recipes, specially breads. Make sure you check out her blog for more wonderful recipes. My first trial from her collection of bread recipes was Challah Bread which came out really good & now is the turn of Basic White Bread, again with good results. I've mainly followed the original recipe but have made little changes in term of ingredients. So please check the original recipe for full details as I'm only going to write down the changes I've made. Original recipe uses 3-3 & 1/4 cup Bread flour or All purpose flour(APF), I substituted 1 cup of APF with whole wheat pastry flour & rest I used was APF. I used only 1 tablespoon of sugar & not 2. Salt 1 & 1/2 tsp. I also covered my bread after first 10 minutes of baking as I've noticed in my previous bakes like Challah & Biscotti that my oven brown the breads & cookies little too early so to prevent that covering it loosely with the foil is way to go. I used stand mixer to knead the dough at speed 2 for around 7-8 minutes. Here's another look at the dough/bread at various stages. On a lightly floured surface, roll dough into a rectangle, approximately 9x14 inches. 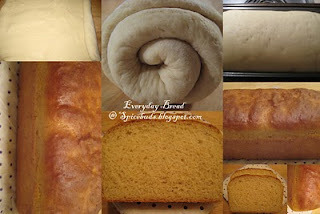 Starting at a short end, roll the dough tightly. Pinch to seal the seam. Pinch the ends & turn them under. Place the dough, seam side down, in a loaf pan. Follow the directions in the recipe for rising & baking. Also sending this bread to Champa's weekly bake-off. Wow looking bread. Thanks for trying it and thanks for the entry. Excellent looking bread. Loved the texture of the loaf. Looks perfect and great tips dear.. I tried baking a bread and couldnt get it into proper shape.. Hope ur tips wud help me next time..
@ Nitha, I'm sure next time it'll be more easy for u to shape the loaf as these instructions never failed me, all the best. Perfect..I love home made breads..They are such a luxury, isn't it ? bread looks real soft and wonderful!! looks soft, clean and tempting! Wow! Looks wonderful! I have to try this recipe and will get back to you.